Gate Review 2019: Is Gate a Good Hosting? Established in 1996, Gate is one of the pioneers in the web hosting industry. Their parent company, Affinity Internet, was acquired by Hostway Corporation in 2007. They pride themselves on providing uninterrupted website hosting solutions well able to meet the performance needs of their customers. Since their inception in 1996, Gate has made a name for themselves in the web hosting industry by offering reliable and affordable solutions to customers all across the world. The hosting company is owned by Hostway Corporation and uses the same data centers as corporations such as Fox News Channel, Wrigley, and Disney. The Gate.com website is only available in English. Gate prides themselves on having hosted mission-critical websites since the advent of the internet itself. They were one of the very first major hosting companies to deploy clustering technology in all their hosting accounts, and they continue to be one of the few reliable web hosts that provide this advanced technology at an affordable price. Today, their web hosting solutions include basic shared hosting and Virtual Servers (VPS). Gate’s Basic shared hosting plan is a Linux-only service best for personal blogs and small business websites — the website builder can only create up to ten pages, and they state that it includes “limited storage.” Upon further investigation, I found out that this “limited storage” actually means 20GB of space, which is fairly decent for an entry-level package. The Business Plan is a Windows & Linux package and includes social media integration, unlimited storage, and advanced analytics. But if you’re looking to create an e-commerce website or make sure that your website is mobile-responsive, you should opt for their Professional Plan instead: this package includes all their e-commerce tools, advanced SEO functionality, a mobile website creator, Facebook manager, and online marketing tools. If at any point you outgrow their shared servers, you’ll be happy to know that Gate does have a VPS hosting option available. Their VPS hosting solutions use Dell R700 Series Enterprise servers, SSD storage, and the latest generation Intel Dual Hex Core Processors. Each server is connected to the company’s 55GB network capacity and enjoys Gate’s 100% network uptime guarantee. While Gate seems great on paper, a good number of users have been frustrated by their service. The platform is not easy for beginners to use, with several users describing their solutions as infuriating. This confusion has in part been brought about by Hostway Corporation’s purchase of the company: after the merger, Hostway moved Gate’s operations to their existing facilities while managing and maintaining the Gate.com website separately. There’s been a huge gap in the operational flow since then, unfortunately. Gate’s pricing schemes are quite reasonable given the many features included in each of their web hosting plans. What’s more, all these plans include a free website builder, social media integration, unlimited web traffic, and email virus and spam protection. Gate offers no free version of any of their hosting solutions, nor do they offer a free trial or a money back guarantee. Fortunately, the vendor does offer special promotional offers now and then, so you can watch out for those if you’re not in urgent need of a hosting service. 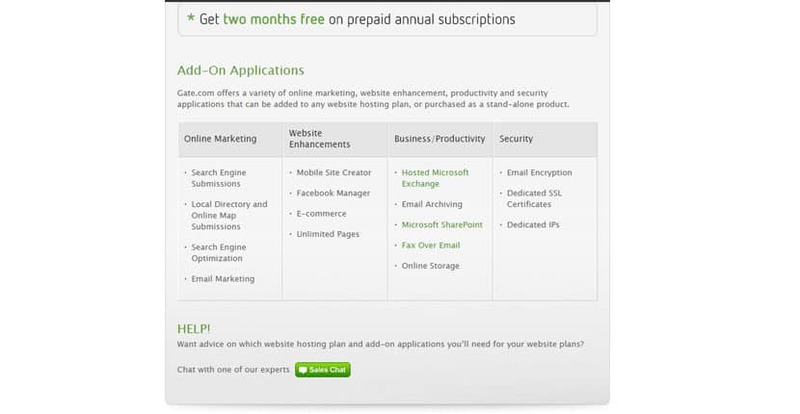 In addition, you get two free months of hosting if you pay for your annual hosting contract up front. Gate provides all their customers with 24/7 technical support via email and over the phone. The support team can help you with server deployment or any other issues including upgrading or downgrading your plan. Disappointingly, while Gate claims they always have their support team standing by, there was no one available to answer the phone when I tried contacting them on two occasions. I had to wait for their office hours to reach someone from their support team. I also didn’t feel that my questions were addressed satisfactorily. That said, the company has gone to great lengths to provide a comprehensive knowledge base, so if you can’t reach one of their tech support staff, you can always try to diagnose the issues on your own. For small and medium-sized businesses, Gate is a good option. However, their limited support staff availability and the rocky transition ever since becoming part of Hostway Corporation may be deterrents for users who require the highest performance from their hosting platforms. Wondering how Gate stacks up against other Web Hosting companies? Enter any other Web Hosting company and we will give you a side-by-side comparison.